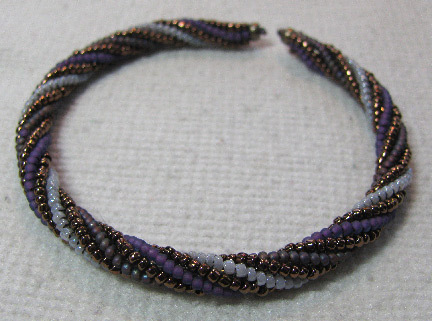 This pretty bangle bracelet simply couldn't be easier to make! 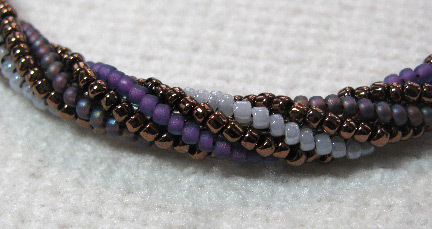 Find four colors of size 11/0 seed beads that you like together. Use a bead tray with compartments to keep them separate, and get ready to stitch. In only two hours of TV "watching," I had a new bracelet! 1. Cut a piece of heavy gauge wire (I used 12 gauge) a bit longer than you expect to need. 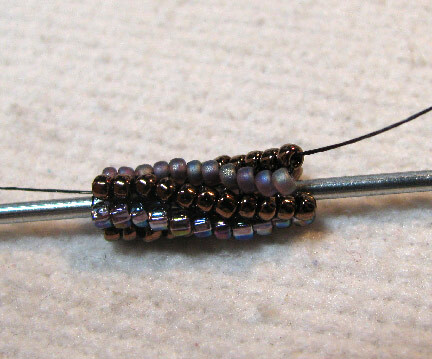 Leave a longish tail of thread, and start your bead weaving with a circular row of double ladder stitch in an even number. Then begin to stitch spiral herringbone stitch around, stepping up at the end of each row. 2. I ended up with four colors, but one of them appeared alternately between each of the others. You can choose your colors as you please, just make sure to keep an even number of beads in the row. 3. 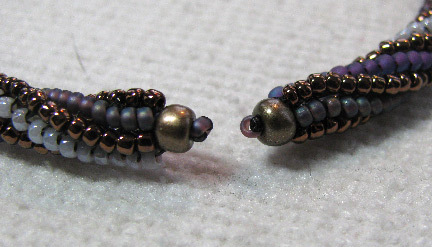 When you get the beadwork as long as needed, finish off with a double row of ladder stitch. Trim the wire and stitch a size 6/0 seed bead topped with a size 11/0 onto the ends to cover the wires.